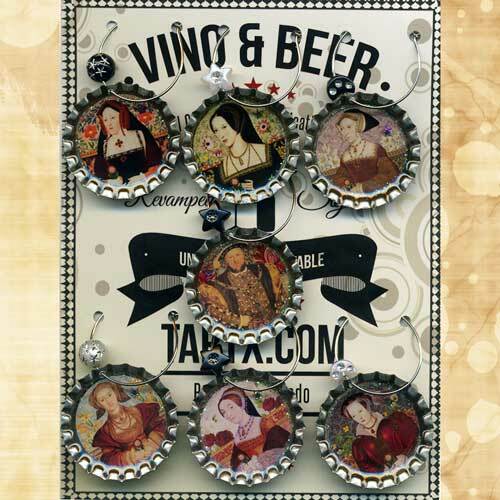 This set of seven beautiful, unique and collectible wine and beer glass charm's feature collages of from the renowned artist Tiffini Elektra X. They show King Henry VIII, Katherine of Aragon, Anne Boleyn, Jane Seymour, Anne of Cleves, Catherine Howard and Catherine Parr. They are just perfect for identifying whose drink is whose at parties and get-togethers. The miniature photograph is protected by a durable, archival resin that safeguards the image from water damage and fading. Wine Charms will come with wine rings as shown, however, suction cups for beer glasses are available as an optional extra. 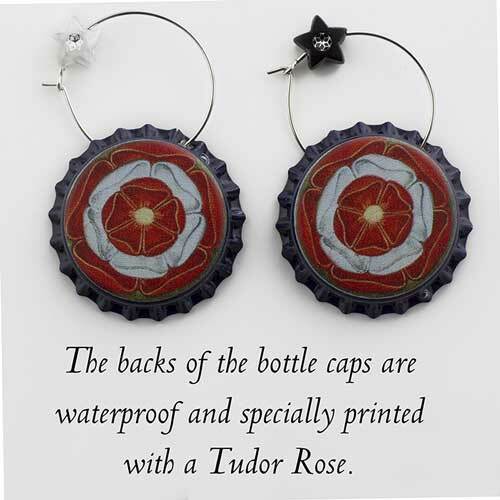 The backs of the bottle caps are waterproof and specially printed with a Tudor Rose. Dimensions: Bottle caps are 1 and 3/16 inch diameter with the edges still flared so that they are not sharp. Set of seven charms comes packaged with an organza bag for safe keeping when not in use. Made in Colorado, USA, and shipped worldwide. Various antique botanical pieces, ornamental papers and vintage bookplates with a Tudor rose placed in each of their hands. Many of the flowers were chosen for their symbolic meanings as well. 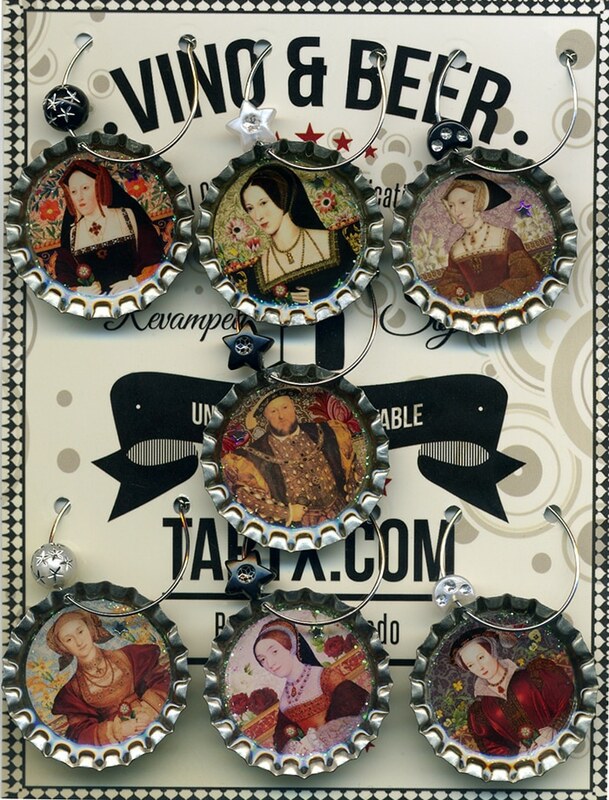 These handmade bottle cap charms are a fabulous way to accessorize and identify your wine glass, martini glass, margarita glass stems, beer mug handles with unique images in each cap. The inside of the bottle caps are decorated with gems and glitter. The miniature photograph is protected by a durable, archival resin that safeguards the image from water damage and fading. * Wine Charms will come with wine rings as shown, however, if you have stemless glasses or drink beer instead - you can exchange the rings out and instead add fabulous and functional suction cups. * The vintage bottle caps are aged bronze on the back and stamped silver or copper with a beautiful ornamental pattern. * Dimensions: Bottle caps are 1 and 3/16 inch diameter. Made from unused vintage caps with the edges still flared so that they are not sharp. * Made in Colorado, USA.